This is my 2nd post of the day, so if you want to read about the disaster that is the New York Knicks, scroll down. The Knicks traded away a little bit too much for the likes of Andrea Bargnani. To read about it simply slide on down the page. Thanks! They should officially rename Wimbledon. They should call it The Wild World of Wimbledon. Just after 10:00 a.m. EST Serena Williams was defeated by Sabine Lisicki. Who? Yeah, you may not have heard of her, but she is the 23rd ranked Women’s tennis player in the world. The match in the round of 16 went the distance. Lisicki won the match by a score of 6-2, 1-6, 6-4. The score was fairly even as we’re the match statistics. 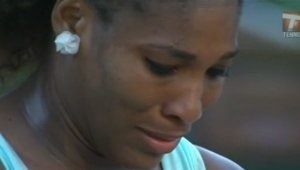 Obviously Serena on her best day can beat anyone in the world, but on this day she didn’t have enough. The only difference in this match was Serena’s missed opportunities. Both Williams and Lisicki converted 5 break points, however Williams had 16 break point opportunities (31% conversion) to Lisicki’s 8 (63% conversion). Lisicki also had 10 more winners than Serena. Overall Lisicki simply played better and more efficiently. With Serena out the draw is wide open. Maybe Serena Jr. (Sloane Stephens) can make a push deepinto the tournament. Or will it be Li Na, who seems to have had the easiest path to the quarter finals so far? Only time will tell. With the way this tournament has played out so far a prediction would be silly, but I’ll give you one anyway. I am going to go out on a whim here and pick Li Na on the Women’s side and Mr. Andy Murray on the men’s side.